Solos for Young Violists is a five-volume series of music books with companion compact discs featuring 34 works for viola and piano. Many of the pieces in this collection have long been recognized as stepping stones to the major viola repertoire while others are newly discovered arranged and published for this series. Compiled edited and recorded by violist Barbara Barber Solos for Young Violists is a graded series of works ranging from elementary to advanced levels and represents an exciting variety of styles and techniques for violists. The collection has become a valuable resource for teachers and students of all ages. The piano track recorded on the second half of each CD gives the violist the opportunity to practice with accompaniments. Solos for Young Violinists is a graded series of works ranging from elementary to advanced levels representing an exciting variety of styles and techniques for violinists -- a valuable resource for teachers and students of all ages. Many of the works in this collection have long been recognized as stepping stones to the major violin repertoire while others are newly published pieces for further choices of study. Situated in the mountains, this apartment building is 1.1 mi (1.7 km) from Kaiserwinkl Golf Koessen and within 3 mi (5 km) of Hochkoessen Cable Car and Pilgrimage Church of Maria Klobenstein. Penninger Schnaps Museum and Catholic Parish of St. Pankratius are also within 6 mi (10 km). Composed by Jill Gallina. For Choral (CLASSRM KIT). Shawnee Press. Seasonal, Hanukkah, Christmas Music, Collections. Shawnee Press #GN0089. Published by Shawnee Press (HL.35024367). Contents are: Concerto in C Major Hob. VIIb 1 (Moderato Adagio Allegro molto) (J. Haydn). This volume contains a few smaller pieces that could be used as warm-up exercises but the majority of the edition is devoted to the entire Concerto in C Major Hob. VIIb. 1 by Franz Joseph Haydn. This work is perfect for students at the intermediate/advanced level and is a vital link to the unique teaching philosophy that is Suzuki! Volume 9 contains both the cello score and the piano accompaniment. Contents are: Concerto in B-Flat Major (Allegro moderato (Cadenza by Frederich Grntzmacher) Adagio non troppo Rondo: Allegro (Cadenza 1 by Frederich Grntzmacher Cadenza 2 by Pablo Casals)) (L. Boccherini/arr. F. Grntzmacher). 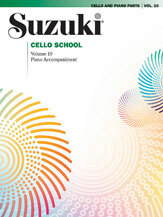 The final volume in the Suzuki Cello School consists of the Boccerini Concerto in B-Flat Major Grutzmacher edition. A very special feature is the inclusion exclusive to this edition of the Pablo Casals cadenza for the third movement. The book also presents initial warm-up exercises and practice tips. Dependable and easy to use. These replacement parts offer the high quality and application flexibility that professionals demand.